Merlot by Bird In Hand of Adelaide Hills. . Adelaide Hills make world class Merlot, genteel, velvety wines, solidly structured, brimming with intense lozenge flavours and resonant with exemplary varietal character. Vinified and pressed into the finest French oak for eighteen months, its fleshy plum and mulberry palate is draped in a delicate muslin of fine, silky tannins. 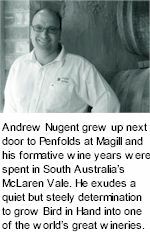 Andrew exudes a quiet but steely determination to grow Bird in Hand into one of the world's great wineries. He lives and works at the winery. Nugent knows the best thing he can do for the community is grow and produce the best wine and olives he can. Bird in Hand's success will be the community's success. A high tide lifts all the boats in the bay. At Bird in Hand Nugent has assembled the best team of people, he's painstakingly selected the perfect terroir and is well on his way. The sense of community emanates from Andrews mother Joy, who is the visionary behind Nurse Link, providing palliative care in the home. She has now gone on to form NurseLink Foundation, a charity to advance nursing in the spirit of Florence Nightlingale and change the way we care for the frail and elderly. Four hundred metres above sea level, the vineyards face north and boast deep, well drained red earth, formed from metamorphic rock. To extend the winemaking range available to Bird in Hand, another vineyard in the famous wine growing region of Clare has been aquired to provide fruit for world class Riesling and Shiraz. The Nest Egg range comprises Bird in Hand's finest wines from each vintage. The varieties released in each Nest Egg series are dependent on near perfect growing seasons. The wines are created with slow deliberation and stored meticulously in the finest French oak. Each bottle is individually numbered and beautifully presented. At the same time the Nugent family established Bird in Hand vineyards, it also began growing olives. Three years later, having perfected natural pickling techniques, Bird in Hand olives and olive oil slipped onto the market, quickly earning for themselves an international reputation as South Australia's finest.